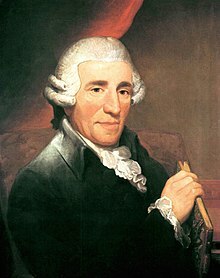 Hi Franz Joseph Haydn (31 Marso 1732 – 31 Mayo 1809), kilala komo Joseph Haydn, in usa nga Austriano nga kompositor. Dies, Albert Christoph (1963). "Biographical Accounts of Joseph Haydn". In Gotwals, Vernon, translator and editor. Haydn: Two Contemporary Portraits. Milwaukee: University of Wisconsin Press. ISBN 0-299-02791-0. A translation from the original German: "Biographische Nachrichten von Joseph Haydn nach mündlichen Erzählungen desselben entworfen und herausgegeben" ("Biographical accounts of Joseph Haydn, written and edited from his own spoken narratives") (1810). Camesinaische Buchhandlung, Vienna. One of the first biographies of Haydn, written on the basis of 30 interviews carried out during the composer's old age. Griesinger, Georg August (1963). "Biographical Notes Concerning Joseph Haydn". In Gotwals, Vernon, translator and editor. Haydn: Two Contemporary Portraits. Milwaukee: University of Wisconsin Press. ISBN 0-299-02791-0. A translation from the original German: "Biographische Notizen über Joseph Haydn" (1810). Leipzig. Like Dies's, a biography produced from interviews with the elderly Haydn. Hadden, James Cuthbert (2010). Haydn (Reissue ed.). London: Cambridge University Press. ISBN 1-108-01987-0. http://books.google.com/books?id=0IXbsEBrSK0C&pg=PA106. Celestini, Federico (2010). "Aspekte des Erhabenen in Haydns Spätwerk". In Celestini, Federico; Dorschel, Andreas. Arbeit am Kanon. Vienna: Universal Edition. pp. 16–41. ISBN 978-3-7024-6967-2. On the sublime in Haydn's later works; in German. Sutcliffe, W. Dean (1989). "Haydn's Musical Personality". The Musical Times 130 (1756): 341–344. JSTOR 966030. doi:10.2307/966030. Ini nga pakli kataposan nga ginliwat dida han 10:01, 25 Enero 2015.